Gallia Academy’s Caleb Greenlee (left) and River Valley’s Nathaniel Abbott set the pace during 1600-meter run held at the Gallia County Meet on April 10 in Centenary, Ohio. River Valley’s Alyssa Lollathin clears an obstacle during the 300-meter hurdles held at the Gallia County Meet on April 10 in Centenary, Ohio. CENTENARY, Ohio — The kings and queens of the county have been coronated. The Gallia Academy boys and River Valley girls came away with bragging rights on Tuesday night during the 2018 Gallia County track and field championships held at the Eastman Athletic Complex on the campus of Gallia Academy High School. 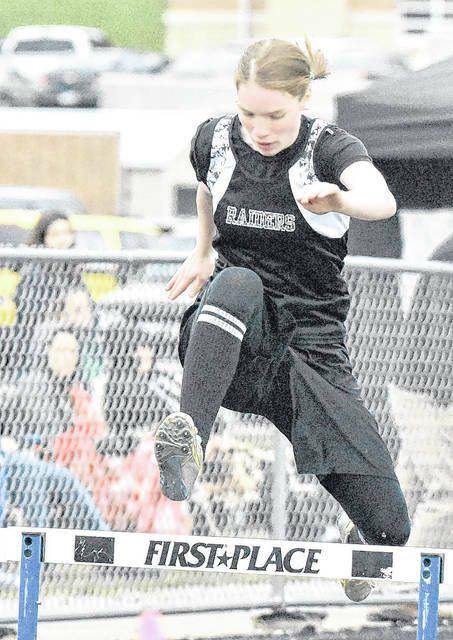 The Lady Raiders dominated the girls competition by winning nine of the 17 total events while claiming a 31-point victory over the rest of the field. GAHS won seven titles and the Lady Rebels also won a single event. RVHS won the girls championship with 126½ points, followed by the host Blue Angels with 95½ points. South Gallia was third with 29 points, while Ohio Valley Christian did manage to muster a single point in the girls meet. The Lady Raiders posted only one victory in four different relays, with the win coming in the 4x200m event as the quartet of Gabrielle Gillman, Sarah Moffett, Hannah Jacks and Savannah Reese posted a time of 2:00.86. Senior Kenzie Baker — who ended up being the high-point scorer in the girls meet with 17½ points — earned a pair of individual titles in the 1600m (5:51.34) and 3200m (12:44.99) events. Baker was also second in the 800m run and was part of the runner-up 4x800m relay team for RVHS. Reese won the 200m dash with a time of 29.81 seconds, while Jacks secured the long jump crown with a distance of 13 feet, 10 inches. Alyssa Lollathin also won the 300m hurdles with a mark of 58.55 seconds. Elisabeth Moffett claimed the discus title (88-0) and Kelsey Brown won the shot put (32-6½) event, with Jenna Burke using a tiebreaker to beat teammate Taylor Huck for the pole vault title with a cleared height of 7 feet, 6 inches. Gallia Academy was paced by Sarah Watts, who finished the meet with 15 points while claiming individual titles in the 400m dash (1:06.16) and 800m run (2:40.00). Watts also joined Kristen Jamora, Brooke Johnson and Brooke Hamilton on the winning 4x400m (4:43.43) and 4x800m (11:47.87) relay squads. The quartet of Brooklyn Hill, Katie Queen, Peri Martin and Gretchen McConnell secured the 4x100m title with a mark of 56.83 seconds. McConnell was also the 100m dash (14.16) champion, while Eliza Davies won the high jump with a leap of 4 feet, 6 inches. The Lady Rebels received their lone event championship in the 100m hurdles event as Olivia Harrison posted a winning time of 19.48 seconds. 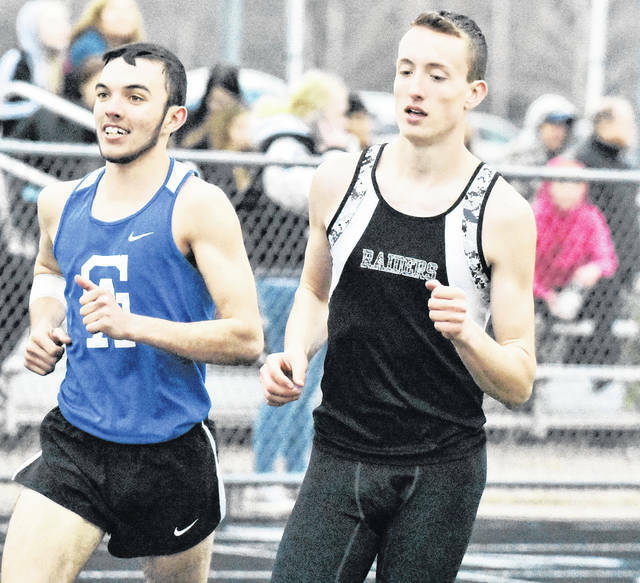 The Blue Devils won nine of the 17 boys events — with the Raiders winning the other eight — en route to a slim four-point victory over the field. Gallia Academy posted a winning total of 114½ points, with River Valley (110½), South Gallia (24) and OVCS (0) completing the team results. GAHS claimed only one victory in four different relays, with the win coming in the 4x100m event as the quartet of Ezra Blain, Cory Call, Ryan Donovsky and Braden Jamora posted a time of 49.25 seconds. Donovsky — who ended up being the high-point scorer in the boys meet with 19½ points — also secured wins in the 100m (12.15) and 200m (24.90) dashes, as well as the long jump (18-7). Logan Blouir claimed titles in the 400m dash (56.56) and also in the high jump with a cleared height of 5 feet, 10 inches. Blain also captured the 110m hurdles crown with a mark of 17 seconds even. Ian Hill was the 300m hurdles champion with a time of 45.50 seconds, while Oliver Davies won the pole vault with a cleared height of 10 feet, 6 inches. Nathaniel Abbott — with 15 individual points — led the Raiders with a pair of wins in the 1600m (5:01.60) and 3200m (11:33.21) events. Abbott joined Caleb McKnight, Brandon Call and Kyle Coen in winning the 4x400m relay with a time of 3:51.87. Abbott, Coen, Call and George Rickett also won the 4x800m relay with a mark of 9:24.23. The quartet of Call, Cole Young, Jared Reese and Layne Fitch secured the 4x200m relay crown with a time of 1:42.64. Call also won the 800m event with a mark of 2:22.29. Eric Weber won the discus with a throw of 138 feet, 9 inches. Ty VanSickle claimed the shot put title with a heave of 40 feet, 4 inches. South Gallia had no individual champions in the boys meet, but Kyle Northup did earn the Rebels’ highest finish after placing second in the high jump with a cleared height of 5 feet, 6 inches. With the combination of team scores from both the boys and girls competitions, River Valley ended up being the top Gallia County program this spring with 237 points. Gallia Academy was the overall runner-up with 210 points, while South Gallia was third with 53 points. Visit baumspage.com for complete results of the 2018 Gallia County Meet held at Gallia Academy High School.